3 Of Ukip’s Electoral Candidates In Court For Forgery! 3 Of Ukip’s Electoral Candidates, Matthew Smith, Daniel Thistlethwaite & Michael Monk In Court For Forgery of their electoral application papers! which owes what little success it has had in domestic politics to jumping on passing band wagons and being all too willing to sweep the gutters of both domestic and continental politics to allie with extremists, be they racist, anti homosexual or anti Jewish – in return for money – there is a disproportionate amount of infighting and criminality amongst its cult members! All too often Nigel Farage’s proteges betray the party and revert to type, which is one major drawback of Nigel Farage’s ability to rig internal selection and election processes, as enshrined in the Constitution he pushed upon his followers, when it is all too clear his judgement is not just flawed but based on fear of any competition to his absolute rule, of his clique and its claque. It is all too clear that this underlies the exceeding low grade of both his elected associates and the staff he has selected, many of whom would appear to have bought their positions in one way or another. With their rigid central control, Regional Organisers, Press Office, local staff, Returning Officers and all powerful leader Ukip is in no position to disassociate itself from complicity in this apparent criminality. A former parliamentary candidate for UKIP has appeared in court to deny forging signatures on election nomination forms. Matthew Smith, 27, of High Street, Gorleston, Norfolk, pleaded not guilty to six counts of making a false statement in the papers. Norwich Crown Court heard one of the papers was signed by his father, grandfather and stepmother. Mr Smith said they would have been happy to sign the form. He said if the signatures were fake, somebody else must have been responsible for completing it. The charges relate to elections in the Great Yarmouth district in May 2013. Mr Smith, a former Conservative, said his decision to join UKIP had caused a lot of ill-feeling amongst Tories and this could have led to someone “substituting” the forms he submitted to the council. He said it would have been impossible for him to have forged some of the names without knowing what the correct signatures looked like. Mr Smith, who also denies three charges of making false nominations papers, is a Norfolk County Council member for Gorleston St Andrews and also acted as the party’s agent in the area in that election. He had been selected to stand for parliament in Great Yarmouth at the next general election, but withdrew in July. 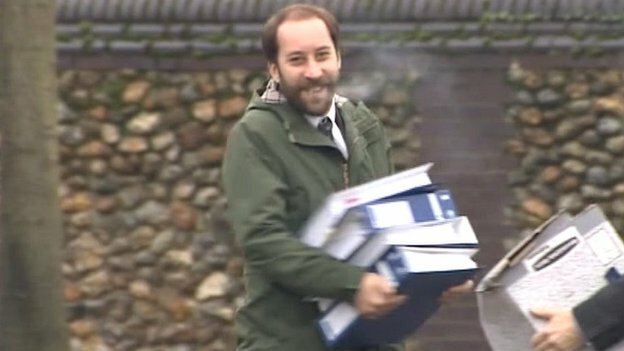 Brett Weaver, prosecuting, earlier said Mr Smith intended to deceive the authorities by submitting false nominations for candidates hoping to stand in the 2013 election for Norfolk County Council. Two other men – UKIP member Michael Monk and Daniel Thistlethwaite, who stood as a candidate in the West Flegg ward at the same election – are also on trial. Under electoral rules, all candidates standing in council elections must obtain 10 nominations from members of the public. Monk, 60, of Freeman Close, Hopton, and Thistlethwaite, 19, of Station Road South, Belton, each deny one charge of making a false statement in nomination papers. This entry was posted on 16/01/2015 at 10:58	and is filed under UKIP. Tagged: Daniel Thistlethwaitye, GL-W, Greg Lance-Watkins, Greg_L-W, Matthew Smith, Michael Monk, Nigel Farage, UKIP, Ukip Electoral Fraud, Ukip Rigged Elections, Ukip Rigged Selections. You can follow any responses to this entry through the RSS 2.0 feed. You can leave a response, or trackback from your own site.